It all began in March when an event was shared around on Facebook. Something within me stirred, then it kept popping up in my new feed – daily. I began dreaming that this could really happen. 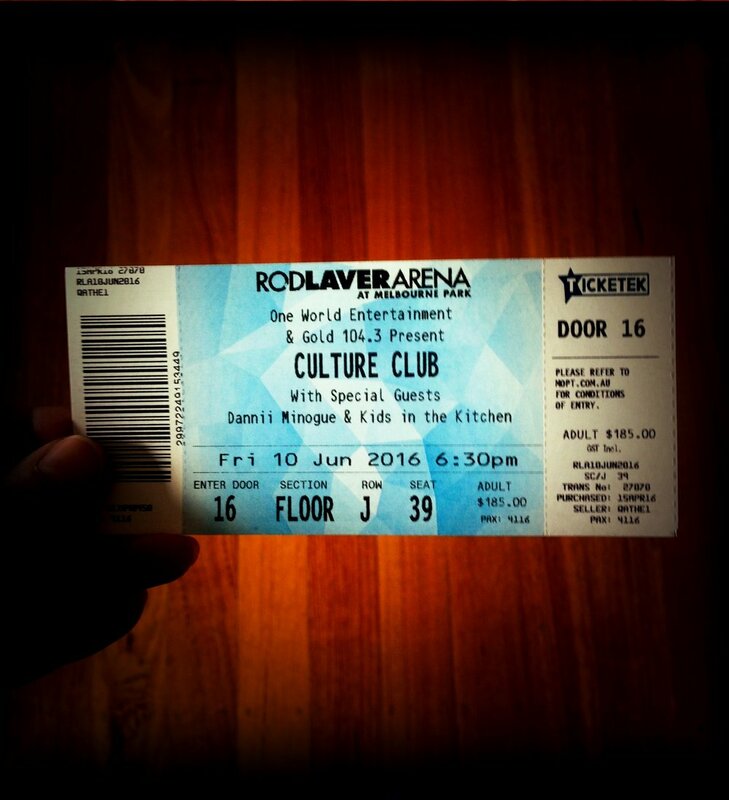 Culture Club was coming Australia. I began looking up floor plans and prices for a ticket only realising they were not released until early April. From the very moment I laid my eyes on the diamond floor. I guess she knew me well. Since the days of Karma Chameleon I had had an indescribable love for Boy George. Although it went doormat for a while, I still would find myself reading about him from time to time. Even though Culture Club had started a world tour recently, I really wanted to go then but something inside of me was acting strange. I didn’t understand why I was felt that way. Then he got a throat infection. But that didn’t stop the daily visions of myself at the Culture Club in the diamond section. The location of my seat was to the right of my image. At short notice to my site manager I applied for annual leave for the first week of April. My visions got stronger as the day drew closer. Then on the day of the release, I jumped online determined to obtain the best ticket. After several attempts and many frustrated words, I discovered it was going to tally up over $400 for that one limited single diamond ticket. This was impossible for me. I couldn’t imagine myself not going. My hand flew onto the touch pad, I clicked on the email, thoughts flashed through my mind. That this email was something I believed was once lost and I would never see again had found it’s way to me. An overwhelming feeling arose over me, I promptly responded quoting my mobile number, a habit I refrain from doing due to my hearing loss. Within an hour I receive a phone call from the ticketing company. ‘I want the best,’ I said. ‘How much are they?’ I asked without responding to his question. ‘That’s cheap,’ I said. My heart glowed, with a strong knowing that my vision will be fulfilled in a matter of a few weeks. Next day, my phone rang at work and answered it not realising what I had done. I never answer my phone at work. Because I knew it was them. Within minutes of my call, I was a proud fan of a diamond ticket. It was in my hands a few days later. AND yes I was seated in the right side of my vision nine rows from the front.